Guy T. Cherry founded Cherry Oil in 1928. Today the company is run by his grandson Jay Cherry, Jr., and Armistead Mauck (brother-in-law to Jay). The gas, propane, oil and lubes bulk plant located at 2947 Hull Road in Kinston, NC, as well as the Seven Springs plant, located at 5406 NC Hwy 111 South, are managed by Jason Cherry, great-grandson of the founder. Cherry Energy supplies twelve BP-branded retail sites as well as another six unbranded sites (including marinas). Cherry Energy also sells photovoltaic systems providing solar electricity and solar hot water systems. In 1992 Cherry Oil acquired Kinston-based Carey Oil including four retail convenience store sites. In 1999 the company formed C-Energy Solar. Another acquisition was made in 2003 when the company purchased the Kinston operations of Dumas Oil. In 2005 Cherry Oil purchased Herring Gas adding Propane to its line of products. 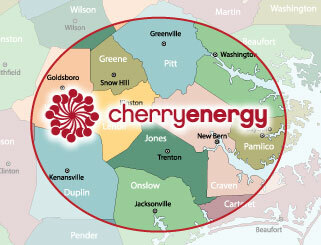 In December of 2006 Cherry Oil changed its operating name to Cherry Energy. The new name was selected to better identify with the wide range of products and services now offered. In 2009, Cherry Energy purchased D. M. Price & Sons adding office operations in Seven Springs, NC.